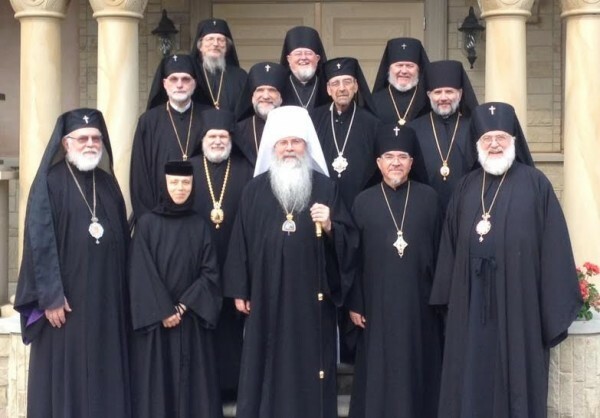 The members of the Holy Synod of Bishops of the Orthodox Church in America began their annual retreat at Holy Dormition Monastery here on Tuesday, June 9, 2015. Members of the Holy Synod with Mother Gabriella, Abbess of Holy Dormition Monastery. Within the context of the celebration of the daily liturgical cycle of Vespers, Matins and the Hours, the Holy Synod is considering a variety of matters, including the theme of the forthcoming 18th All-American Council[AAC], “How to Expand the Mission,” in light of current issues affecting the Church in North America and beyond. His Beatitude, Metropolitan Tikhon offered an opening reflection on progress and concerns experienced during the past three years, to which the hierarchs freely responded. Related matters under review include proposed revisions to the OCA Statute and the Financial Resolution slated to be presented at the AAC; the vision for theological education; and matters regarding external affairs. The members of the Holy Synod are deeply grateful to Mother Gabriella, Abbess, and the monastic sisterhood for their traditional hospitality during the three-day gathering. The hierarchs also will visit the Vatra—the headquarters of the Romanian Episcopate—where they will be hosted by His Eminence, Archbishop Nathaniel. The retreat will conclude on Thursday evening, June 11.